Benjamin Franklin: Believe it or not, this Founding Father was a pharmacist before he was ever a printer or a statesman. Working as a clerk in a neighborhood mercantile store, he dispensed medicines, herbs and various curatives. Sir Isaac Newton: The man who changed the world with his theory of gravity served as an apprentice apothecary in Grantham, England, living with the town’s apothecary at Cambridge, where he began his illustrious career in physics and mathematics. O. Henry: The brilliant American writer – author of ‘The gift of Magi’ – worked in a number of diverse jobs before he became a writer. He worked in his uncle’s drugstore as a teenager and became a pharmacist at 19. 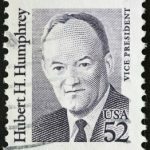 Hubert H. Humphrey: (Vice President of the United States under President Lyndon B. Johnson) The Minnesota democrat worked as a pharmacist in his father’s drugstore, later going into politics and serving as mayor of Minneapolis, a U. S. senator and, of course ,then as vice president. His brief stint as a pharmacist was honored in 1966 when he was named Pharmacist of the Year by the St. Louis College of Pharmacy. The American Pharmaceutical Association bestows its annual Hubert H. Humphrey Award on pharmacists who are known, like Humphrey, for their commitment to civil rights and public service. Henrik Ibsen: The renowned Norwegian playwright spent his teenage years working as a pharmacist’s apprentice. He left home at 15 and made his way to the coastal town of Grimstad where he lived for six years, eventually becoming assistant pharmacist. Charles Walgreen: After losing part of a finger in an accident at the shoe factory where he worked, Walgreen, at the sugession of his doctor decided to apprentice with a local druggist. He later studied in Chicago and became a pharmacist, interrupting his career to serve in the Spanish-American War as a volunteer. Dante Alighieri: The great Italian poet and author of “The Divine Comedy” was a member of an apothecary guild in the late 1200′s. John Pemberton: The inventor of Coca Cola was Confederate war veteran who had been wounded at the Battle of Columbus, Georgia. Like lots of other wounded veterans, he became addicted to morphine. After the end of the Civil War, Pemberton developed a precursor to his famous drink by experimenting with coca mixed with wine as a cure for that addiction. After temperance legislation was passed in Georgia, he experimented with a recipe–with the help of another pharmacist–for a non-alcoholic refeshment which became known as Coca-Cola. Pemberton invented his drink as a cure for headaches and nervousness. When it was mixed with carbonated water, it was sold as a fountain drink. Agatha Christie: Even the famous crime writer Agatha Cristie was a pharmacy technician. It is speculated that is why in many of her tales she used poisons and medicines as a means of killing her victims. Benedict Arnold: One of the most infamous figures in United States history, a smart military tactician who fought for the colonists before he switched sides. Before the Revolutionary War, Arnold was the owner of his own apothecary shop in New Haven, Connecticut. As a teenager he learned the trade as an apprentice in a shop owned by his relatives Daniel and Joshua Lathrop — when he wasn’t running off to fight wars, that is. As a young man he toured Europe, then returned to Connecticut and opened his own shop, with his sister Hannah as his assistant. Once the Revolutionary War started, he apparently abandoned his apothecary business so he could go down in history as a traitor.